What’s all that stomping you hear? It’s just us doing the happy dance. 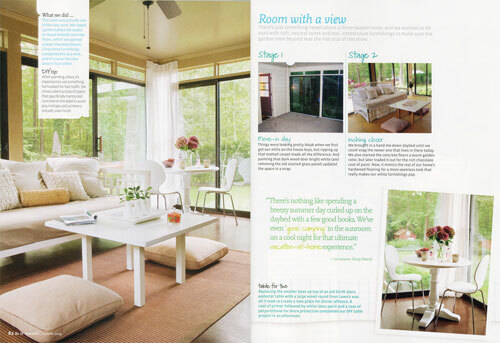 We’re super excited to share the second installment of our home makeover in Do It Yourself magazine. 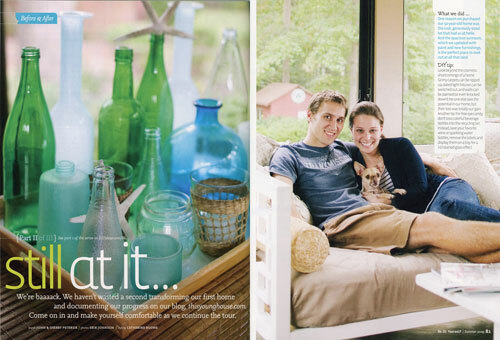 They shot our house back in October (here’s a fun look behind the scenes) and actually asked us to write a three part series about making over our humble little brick ranch to run in their Spring, Summer, and Fall issues (available everywhere from Target to Home Depot and of course Barnes & Noble). We still can’t believe that we’re bona fide contributing editors for a national magazine (hence all the dancing). 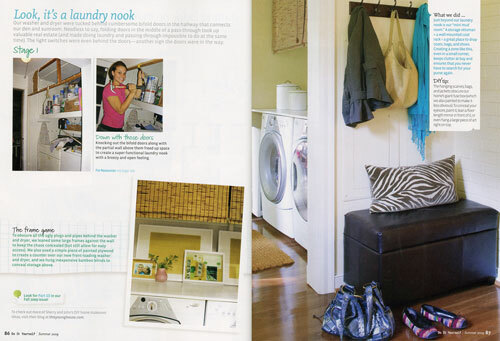 While the last issue was all about the step-by-step transformations that we whipped up in our kitchen and living/dining room, this issue moves on to cover the sunroom, den, laundry nook and mudroom (click to read the text on DIYideas.com). Look here we are relaxing in the sunroom. The funny thing about this shot is that we were actually just sitting there (trying to stay out of the way of the cameras) when the crew decided they should snap a few photos of us enjoying our downtime. Who knew the shot would make the story?! Doesn’t Burger look like a zombie with his little arms out? It totally cracks us up. I’m already back with an update Sharee! The florist is actually located out of California but she’s a wholesaler so you might need an account to work with her. They’re called Mayesh and Beth Eslinger’s contact there is Laura London. Here’s the number: 888-462-9374. Hope it helps! I have a question for you on DIY magazine. 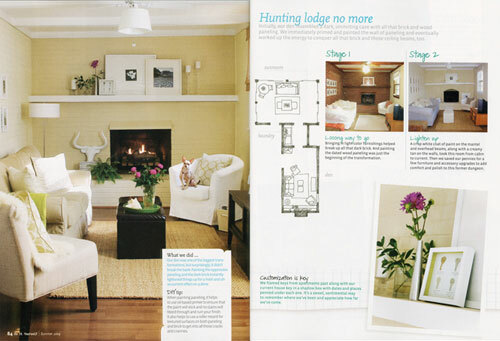 A little back ground-We did a home makeover project to raise money to build a Habitat for Humanity House in NOLA. The project was really amazing. Like we took cat stained floor that we used a 6′ sticker stencil to make to make look like an inlay wood oriental carpet. We added wood panels to update an old frig etc. and the results were published in the book “The House that Faux Built: Transform Your Home with Paint, Plaster and Creativity” (100% profit goes to charity) You can download free chapters and see videos at http://www.fauxhouse.com. 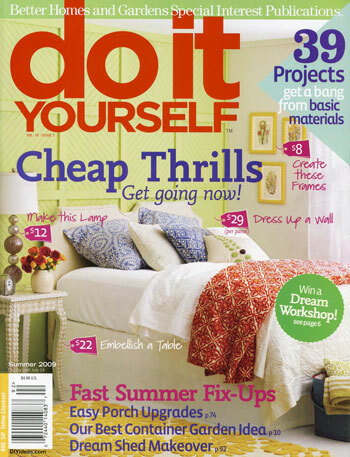 So my question is-Are you in a position to submit articles on other projects besides your own to DIY magazine? Or if not, is there anyway you could email me with a contact that I could either email or send a book to? I’m at [email protected]. The projects really were amazing.